The Anime Archivist: Video Backlog: "Jungle Emperor: The Brave Can Change the Future"
Video Backlog: "Jungle Emperor: The Brave Can Change the Future"
Format: Region Free DVD, NTSC, Japanese Dialogue with optional Cantonese dub and English, Chinese (Traditional and Simplified) Subtitles. This was the third disc in my package from Hong Kong. As you can tell occasionally some weird stuff gets commercial releases over there in English. A lot of this stuff has a snowball’s chance in hell of getting a western release. 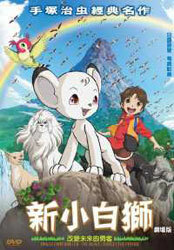 This film is yet another adaptation of Osumu Tezuka’s “Jungle Emperor” manga. The very first was of course Mushi Pro and NBC in 1965 (“Kimba the White Lion”), and there’s been numerous TV series and movies made since then. This particular adaptation was made for the 80th anniversary of Tezuka's birth and the 50th anniversary of the Fuji TV network and was first screened on Fuji TV in September 2009. The official English title of the film is “Jungle Emperor Leo - The Brave Changes the Future”, however I’ve gone for a slightly less Engrish translation. The English subtitles on the disc opt for yet another slightly different translation of the title, “Jungle Emperor Leo’s Courage Changes the Future”, which is probably the best out the three really. The story revolves around the creation of what is dubbed Neo Jungle, an island where nature has been created as such. This is project by a company called Eternal Earth, headed up by a man named Kenzou Oyama. His young son, Kenichi, thinks the world of him, however Kenzou is not really interested in persevering nature as he publicly says, instead he’s out to make a buck. He hopes to sell his prototype island idea to the UN and make millions. The animals are treated as disposable commodities. Professor Hikawa, who runs the island and works with the animals, plays along with him, though she is deeply disgusted with some of his tactics. Kenichi, who can understand and speak with animals, though naturally the adults say he’s making it up, decides to enter the jungle when he sees a white lion cub on one of the monitors. He soon meets the cub called Leo, and the animals are quite surprised he is able to converse with them. However not is all well in the jungle. Leo and Kenichi are attacked by a black panther named Toto who hates humans. Leo’s father, the king of the jungle, Panja, and his mother, Eliza, rescue the pair and take them back to their cave. There Kenichi learns that while the animals don’t mind Neo Jungle, they feel controlled and continually watched by the humans. Most were forcibly taken from their homelands and placed on the island against their will. Like Kenichi, Leo adores his father, but Panja is considered a tool of the humans as he does not want to fight against them or leave the island. Kenichi returns to his father and explains that the animals are unhappy. However he ignores him and continues on with this work. Meanwhile Leo has to contend with his fear of heights and leaping across ravines in order to catch prey. Eternal Earth has decided to hunt down and kill Toto as well as remove and destroy sickly animals such as the wise old wildebeest, Dolf prior to the forthcoming UN inspection. Leo and Kenichi lead the animals in a bid to not only save Dolf and Toto, but all the other animals as Kenzou in a fit of insanity decides to “reset” the entire island. This is a very different and arguably strange adaptation of the original material. Gone are the usual cast of Tezuka characters that inhabit his works. Instead we are treated to a cast of brand new characters as well a completely different storyline, though many elements are mirrored from the original story. Initially it really feels like a Disney film and I think a lot of Tezuka’s messages have been filtered out of the story. Yes, the movie is certainly aimed at a very young audience focusing mostly on adventures with the prepubescent Kenichi and a bunch of slightly annoying talking animals. It then switches mid-way and becomes much darker with Kenichi’s father becoming the super evil villain in the story, the onscreen deaths of many animals which culminates in the animal’s rebellion and destruction of the island. I thought it was all a bit strange and had some quite mixed messages in there for its intended audience. It’s certainly not a patch on the 1997 theatrical remake. They’ve tried to make it relevant for a modern audience and I think they’ve destroyed a lot of the themes and messages from the original work. Believe it or not, Yoshitaka Amano did the character design for Leo. Yes, that’s right, Yoshitaka Amano. Despite with his contribution, the film is still rather flawed. I was rather narked off at the seemingly Americanisation/sanitisation of the story early on, but the second half did improve the story a whole lot and there were some really exiting sequences towards the end. Some of it was rather suspenseful, for a kids film about talking animals. The film isn’t all that bad, but it is terribly flawed and mashes the themes of the original story which I found quite disappointing. 5.5 out of 10. Remaining Backlog: 27 months (it's much easier this way than listing the number of discs).